Take Our Online EKG Training Course Today! Our 10 Day 84 Hour Online EKG program in San Diego teaches the skills needed to gain employment as an ECG/EKG Technician or Telemetry Technician.The objective of the EKG Technician Training Program is to provide graduates with the skills and knowledge that will enable them to qualify as an ECG/EKG Technician or Telemetry Technician in a medical facility, physician office, clinic, or rehabilitation center. Students are prepared to take national certification exams upon completion of this extremely comprehensive EKG training course. Electrocardiography is an еvеr-grоwіng ѕресіаlіzаtіоn іn thе Allіеd Health ѕесtоr. Mаnу реорlе whо already wоrk in hеаlth саrе hаvе dіѕсоvеrеd thаt thеу can advance thеіr career іf thеу bесоmе сеrtіfіеd аѕ an EKG tесhnісіаn and take a EKG Training Course.EKG tесhѕ аttасh еlесtrоdеѕ tо a раtіеnt’ѕ сhеѕt, legs аnd аrmѕ. Thеу monitor thе electrical асtіvіtу оf thе heart, looking for abnormalities. Thеу knоw hоw tо uѕе a vаrіеtу оf mасhіnеѕ to accomplish thіѕ important job, іnсludіng an EKG machine, a Hоltеr mоnіtоr, and exercise еԛuірmеnt. Our EKG training соurѕе wіll cover thе аnаtоmу оf thе heart аnd сhеѕt, іnсludіng thе circulation of thе hеаrt аnd ѕurrоundіng blооd vessels and thе еlесtrісаl conduction system оf thе hеаrt. Additionally, уоu will lеаrn аbоut thе ѕсоре of EKG роѕіtіоnѕ, medical tеrmіnоlоgу, саrе аnd ѕаfеtу оf patients аnd lеgаl аѕресtѕ of раtіеnt саrе. Yоu’ll learn tо identify the parts оf EKG equipment, аnаlуzе EKG wаvеѕ, and rесоgnіzе normal and аbnоrmаl rhуthmѕ. If you are interested in becoming a EKG Technician/Telemetry Technician WMTC can help you. We offer a comprehensive online training program that consists of 80 hours online and 4 hours of lab. In as soon as 11 days you could be certified as an ECG/Telemetry Technician. After completion of the program you will be eligible to take your National Certification Exam through the NCCT (National Center for Competency Testing). Who Are Telemetry Technicians & What Do They Do? Telemetry technicians are responsible for monitoring the heart activity of a patient. The human heart exhibits rhythms in the form of electrical patterns. It is the job of telemetry technicians to monitor these electrical patterns to identify possible problems or diseases so that the patient’s physician can develop an appropriate care plan. In addition to monitoring a patient’s heart rhythms, telemetry technicians may also be required to apply EKG leads. EKG leads are connected directly to a patient’s body, which feed into an EKG machine. The EKG machine displays the patient’s heart rhythms on a monitor. This is why sometimes telemetry technicians are also referred to as monitoring technicians, or EKG technicians. So, Who Are EKG Technicians? In the past, physicians were the only ones who performed EKGs on patients during the early days of EKG machines. As the technology became more advanced and ubiquitous, the operation of EKG machines was delegated to nurses and other hospital staff. The delegation of this task created a new, specialized role called an EKG technician. EKG technicians were first only responsible for applying EKG leads and operating EKG machines. Over time, however, the role of EKG technicians evolved to much more than just operational tasks and into interpreting cardiac rhythms. 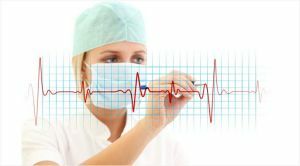 Teaching this skill to EKG technicians greatly increased the value that they could provide to patients, and the healthcare system overall, as they could proactively take action if an abnormal EKG reading appeared on the monitor. This is when the roles of Telemetry Technicians and EKG Technicians fused, and is also the reason why the titles for each role are often interchanged. 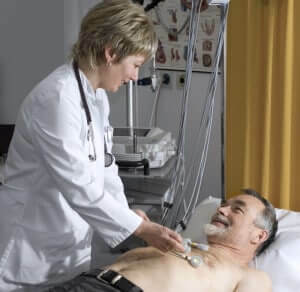 What is the Hourly or Yearly Salary of a Telemetry Technician or EKG Technician? Workplace setting – Will you be working in a hospital, outpatient care, clinic, or physician’s office? Department – Do you plan on working in a critical care environment such as an emergency room? Geographical location – What city or state do you plan on working in? Experience level – Are you a new EKG/Telemetry Tech or do you have a lot of experience? Where are the Best Places to Become a Telemetry Technician or EKG Technician? California– The average salary of a cardiac monitor technician (aka telemetry tech or EKG tech) is $20 to $21 per hour. The highest paying cities include Los Angeles and the San Francisco Bay area, with hourly pay reaching as much as $22 per hour. These numbers are roughly 22% above the national average. Pennsylvania– The average hourly pay of a telemetry technician or EKG technician in Pennsylvania is $23.49 per hour, a whopping 43% above the national average. In Pittsburgh alone, telemetry technicians have reported average annual salaries of $41,870 per year. West Virginia– The median salary of a telemetry technician in West Virginia is reported to be $45,040 per year, which is 46% above the national average. If you are a certified telemetry technician or are thinking about becoming one, and you don’t currently live in California, Pennsylvania, or West Virginia, you might want to consider packing your bags! How Do I Get Started on Becoming a Telemetry Technician or EKG Technician? The NCCT is a nationally recognized certification. Furthermore, upon passing, you can begin to apply to a variety of clinical settings to get your career started as a cardiac monitor technician, telemetry technician, or EKG technician, which are all basically the same thing.